The multi sports course is designed to inspire young people to become more physically active by giving them the opportunity to take part in a wide variety of sports and activities. The course is delivered by the Council’s Every Body Active 2020 Coaches. 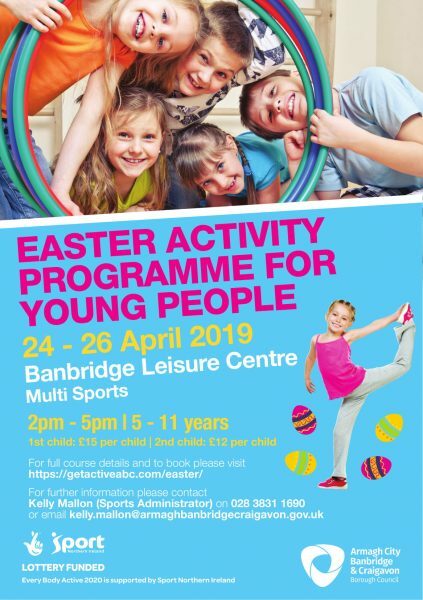 This years Easter Activity Programme in Banbridge Leisure Centre takes place on Wednesday 24th to Friday 26th April 2019. The Multi Sports programme will run from 2pm – 5pm each day. Yes booking is essential for the event. Booking can be completed using the widget below.